Got myself a second hand Apple Aiport Extreme and during configuration it stopped working. After A LOT of trial and error, discovered it was due to a setting, which is not properly explained. On the back of the device are 4 ethernet ports, clearly marked differently. 3 with the usual <--> for ethernet and one with a kind O, which is for the internet, if you have a cable modem, or maybe a half bridge DSL router. So we have a very clear paradigm of internet and LAN. Right, here's the INTERNET tab of the Airport Utility. So I'm thinking this is where you configure INTERNET access. Right? Wrong! In fact this configures the LAN. So, turn off the ethernet WAN port at your peril, because if you do you'll fall off the LAN and you'll have to do a reset. Your spellcheck's not working either. Actually, that panel IS where you configure the Internet connection attached to the WAN port on your Airport. With an Airport highlighted on the left side of the Airport Utility, you will see a 'Continue' button on the lower right. You should click that, as it will walk you through the Setup Assistant in the Airport Utility. You're obviously double-clicking the Airport shown on the left side (or clicking the Manual Setup button) which probably not the best choice for you, since you're posting INCORRECT help info on the Web. 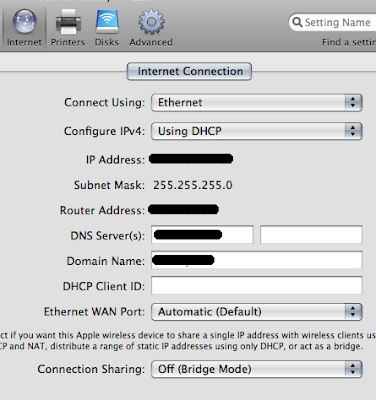 "Connect to internet" using your "Ethernet WAN" port. Wow, yeah. This is the most confusing dialogue box ever. Seems pretty straightforward to me... This is where you configure your internet connection. Why are you bridging? I'm not sure I understand the confusion. I've been using AirPort for a few years now and I've setup more than a dozen AirPort networks for friends and family members. Not once have I ever been confused by the ports and/or the AirPort Utility software. Before blaming others, one should reflect on himself first. When you point a finger at another, four other fingers are pointing right back at yourself. Thanks for reading, and leaving comments. Markian - I'm bridging because my Extremes are simply to join the laptops wirelessly to the LAN. I have a separate hardware firewall, which sits behind the broadband router. Thus in bridging this panel is not about connecting to the Internet, its about connecting to the LAN. - If I'm pointing fingers, I'm pointing them at me, so if I point one at me, then 4 point somewhere else? I guess what wasn't clear to you was that since you were set to just bridge, there weren't separate settings for LAN vs. WAN. The "WAN" port gets bridged in with the LAN ports (and WLAN), and your base station only has one IP address, which is reachable via all ports (because the base station is now just like a host with a single NIC plugged into its integrated Ethernet switch). I'm curious to know what kind of settings you were setting on the Internet tab, and how they could have been valid for your base station's Internet connection but not valid for your LAN in this case. My mistake, silly me, was to think that the internet tab had settings I didn't need, since the Extreme does not connect directly to the internet, its just a bridge. So the setting change I made in error was to turn off the ethernet WAN port.